‘Stand still and this policeman will arrange the sash.’ Possibly one of strangest instructions I have ever been given, but somehow in keeping with the surreal experience of taking part in Bun Pha Wet Fair. 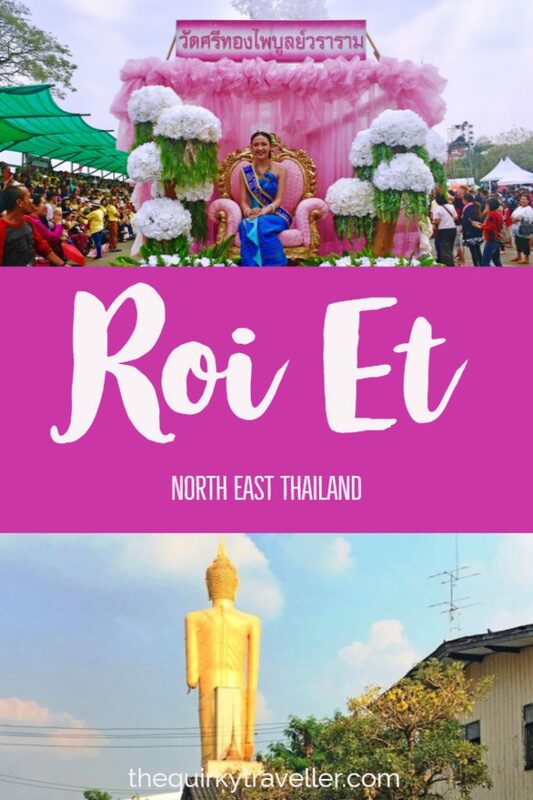 It’s one of Thailand’s lesser-known and very colourful festivals and happens every year in Roi Et in the north east of Thailand. 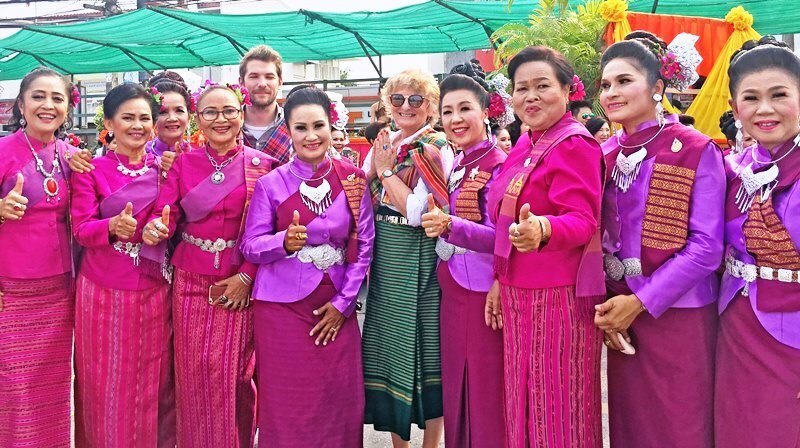 I was dressed in beautiful green Thai skirt and had been given a colourful swatch of material, which I was having difficulty draping in the appropriate style. A helpful policeman carefully arranged it over one shoulder, tweaked it slightly and gave me the thumbs up. This area is renowned for its textiles and our outfits were made with traditional NE Thailand design. The woman who was organising our outfits nodded approvingly and moved on the next hapless foreigner. 12 of us from all over Europe had been invited to join in the ‘Parade of Upakhut’; a novel experience for us all. 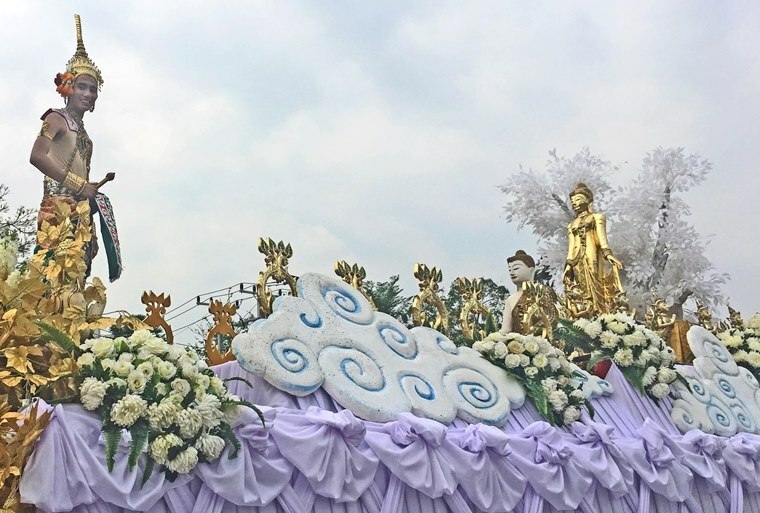 Bun Pha Wet Fair celebrates the fourth reincarnation of the Lord Buddha before he was born as Prince Siddhartha. People from all over Roi Et Province and beyond, come together for this festival, usually held in the fourth lunar month. It’s a sort of Asian cross between Mardi Gras and an English carnival. Dancers parade along the street, bands play music, floats illustrate the story of Buddha and the Festival Queen waves graciously to the cheering crowds. Very few foreigners were in the audience and we were certainly the only one in the procession. 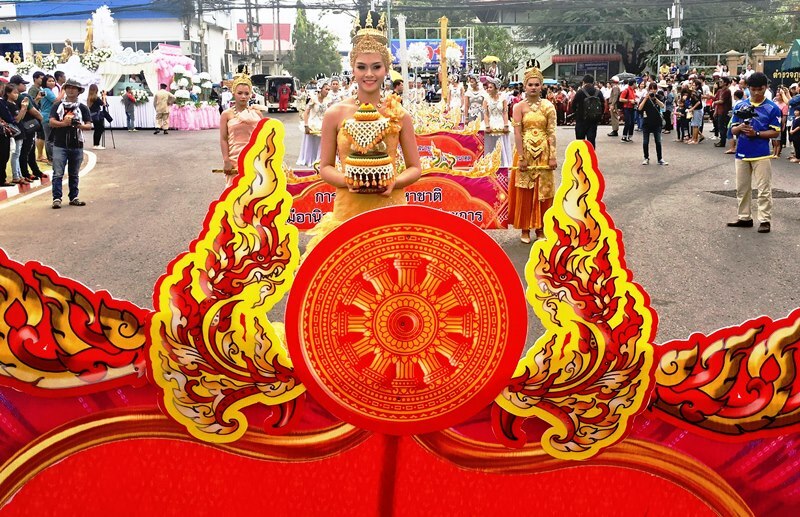 It felt quite surreal to be dressed up Thai’style and be a part of something so local. Everyone was incredibly friends, smiling and wanting to have their photos taken with us, whilst we were taking photos of them. After about an hour we were ready to set off. 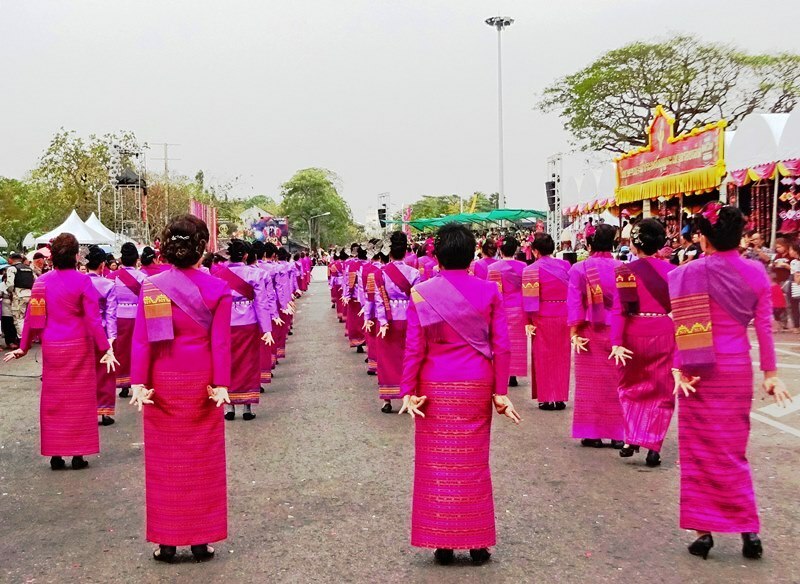 We’d been put near the front of the parade, behind a group of delightful Thai dancers, all dressed in pink and purple, who had taught us the rudiments of Thai dancing. Ladies ‘of a certain age’, they were both gracious and giggly, clearly proud to be taking part in such an important event. They gracefully twirled their arms and fingers in the most beautiful manner, whilst we awkwardly tried to copy them, failing hilariously, much to the crowd’s delight. 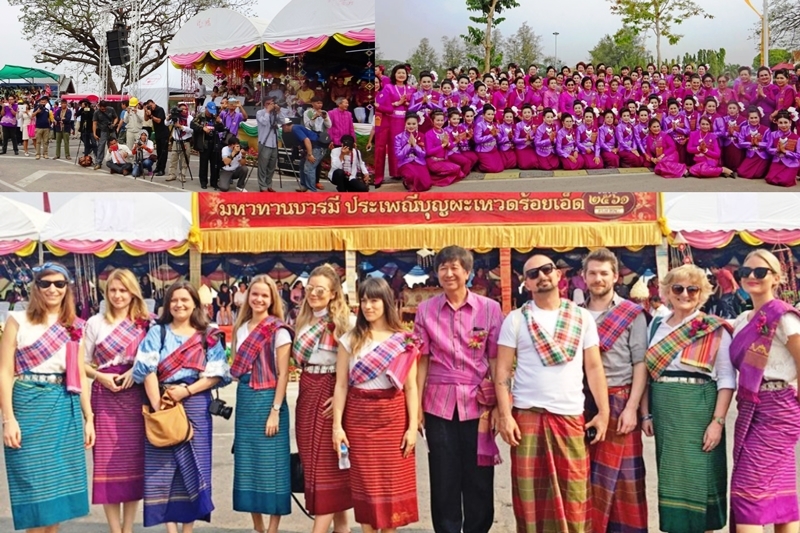 As we entered Bueng Palarnchai Lake Park an announcement was made, welcoming to group of European visitors to their festival. A big cheer went up, cameras clicked and everyone waved to us. I waved back somewhat self-consciously, feeling quite overwhelmed by the welcome and enjoying every minute. When the procession had finished we spent some time looking at the floats, chatting to our guides and taking more photos. The lovely dancers posed for a photo and gave a group namaste, hands pressed together in elegant farewell. Lunch was at Jor Kor Farm 101, a seafood restaurant very popular with locals. On the way in we passed vats of fish, prawns and crabs swimming vainly around waiting to be hooked out for our delectation. Families, couples and groups of friends sat in individual open-air ‘pavilions’ eating platters of freshly-cooked food. 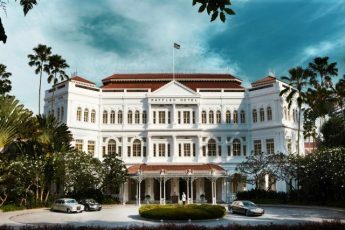 We were seated at a long trestle table in the VIP Lounge (ie indoors with air-con) and served a splendid banquet of local dishes, spicy, flavourful, presented with insouciant efficiency. 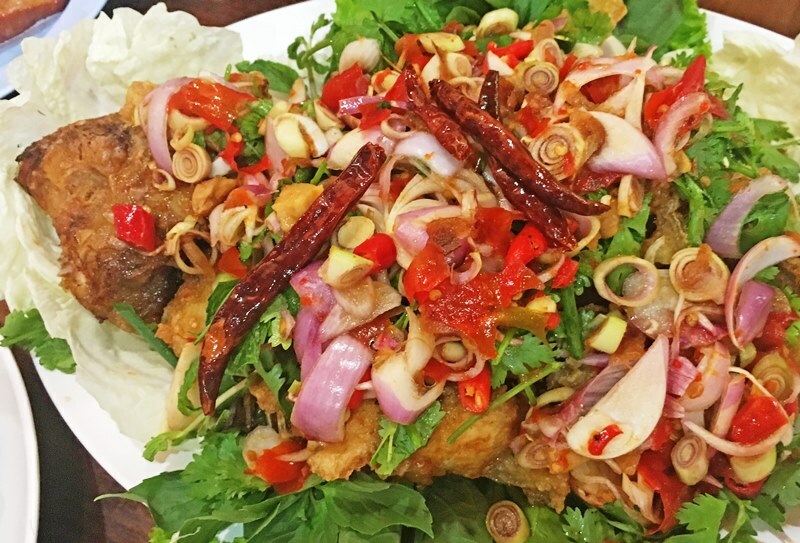 As well as the more familiar Pad Thai noodles and hot n sour Tom Yung Goong soup, we had bowls of seafood including squid and mussels, freshly-caught prawns and whole fish dressed with chillis, lemon grass, spring onions and coriander. Vegetables in light-as-air batter were paired with sweet chilli sauce. Thai food is my absolute favourite cuisine in the world and this trip was a culinary treat every single meal. 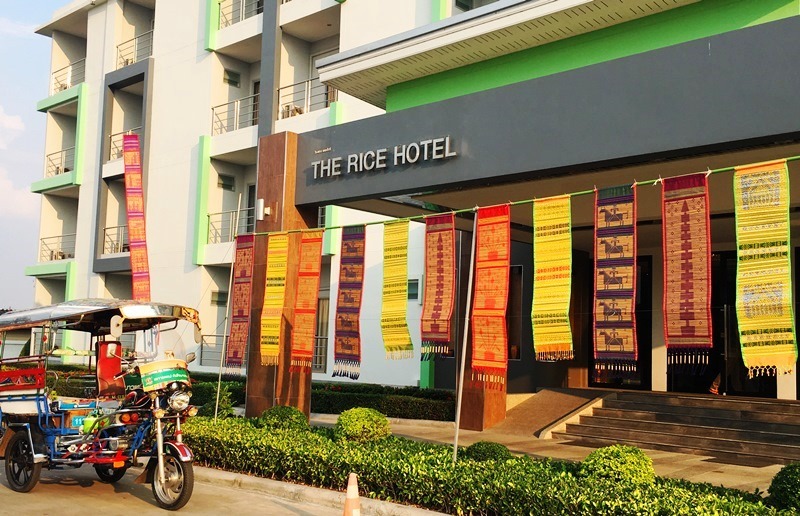 We stayed at The Rice Hotel in Roi Et, a mid-range, comfortable hotel, similar to Premier Travel Inns in the UK. 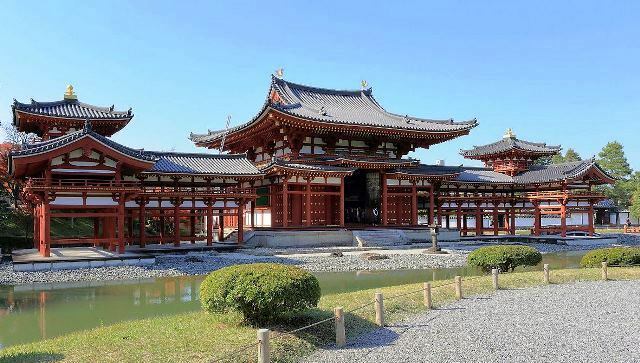 This region is only just opening up to international tourism and currently there is not so much choice, but that is sure to change as more people discover its attractions. It’s one of the biggest rice-growing areas of Thailand; the previous day we had visited Mekin Organic Farm, where we had a go at planting rice. It’s back-breaking work. That evening we were picked up by brightly-decorated ‘Sky Labs’ (like a big tuk-tuk) and whisked off for a night-time tour of the city. 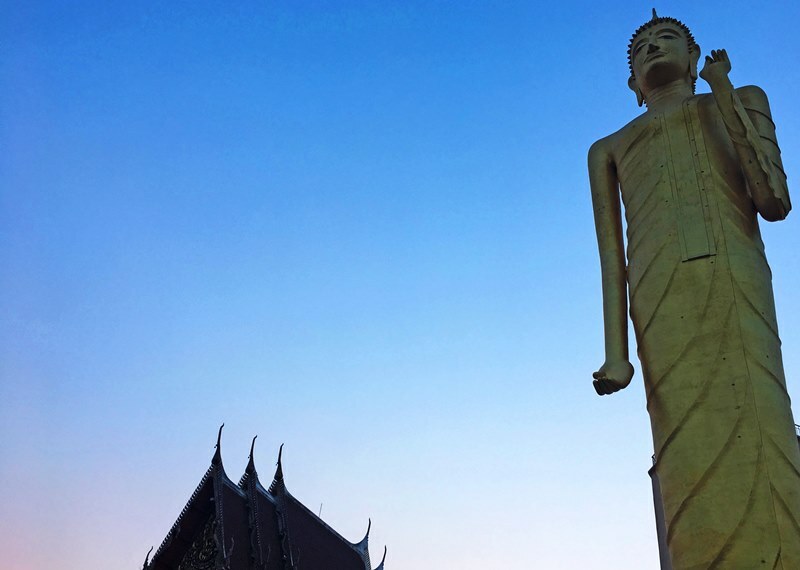 First stop was Wat Burapapiram, home to the TALLEST STANDING Buddha in Thailand. and one of the tallest statues in the world. From top to toe it’s 59m 20cm and including the base is 67m 85cm high. One of the head monks gave us a blessing and posed for photos. 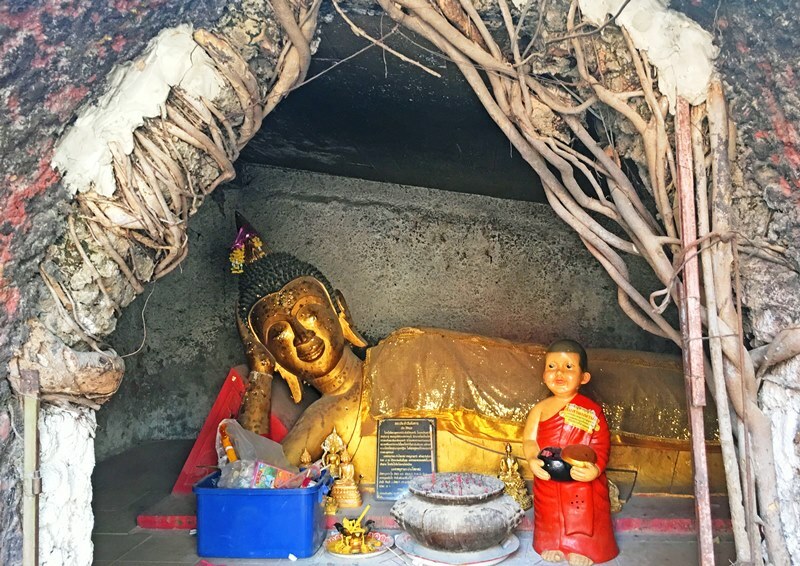 There’s a little cave nearby with a reclining Buddha and some rather strange figures dotted around amongst the trees, representing scenes from the life of Buddha. From here we whizzed round town, lights a-glitter and crowded with people come in from the surrounding area to enjoy the festival. I caught a glimpse of a young elephant being led past the market. Our guide told us there aren’t many elephants in this part of Thailand and it’s illegal to bring them in to the towns. Its owner was probably doing it to make some money from photos, though how such a large beast could avoid being seen by the police is a mystery. 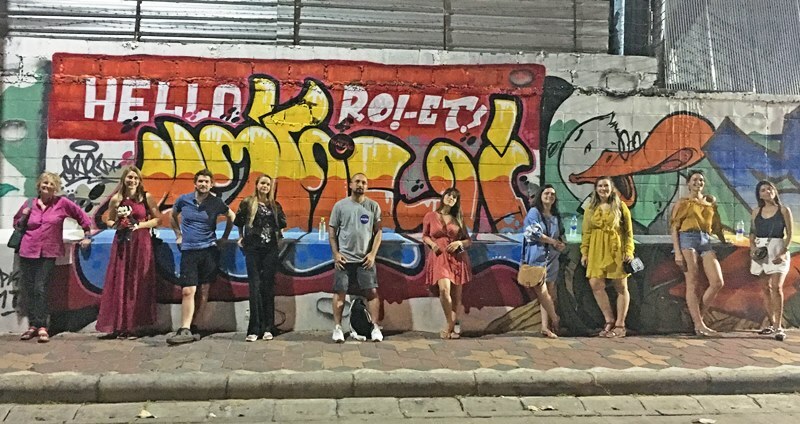 We stopped off in a side street near the river to admire some street art. As in many places around the world, Thailand now recognises the value of quality street art and permits certain areas to be used for display. From here it was a short tootle back to Bueng Palarnchai Lake Park to rejoin the Bun Pha Wet Fair. There was a Light and Sound performance of the reincarnation of Buddha, hosted by a couple of local celebrities, reminiscent of the Eurovision Song Contest hosts. 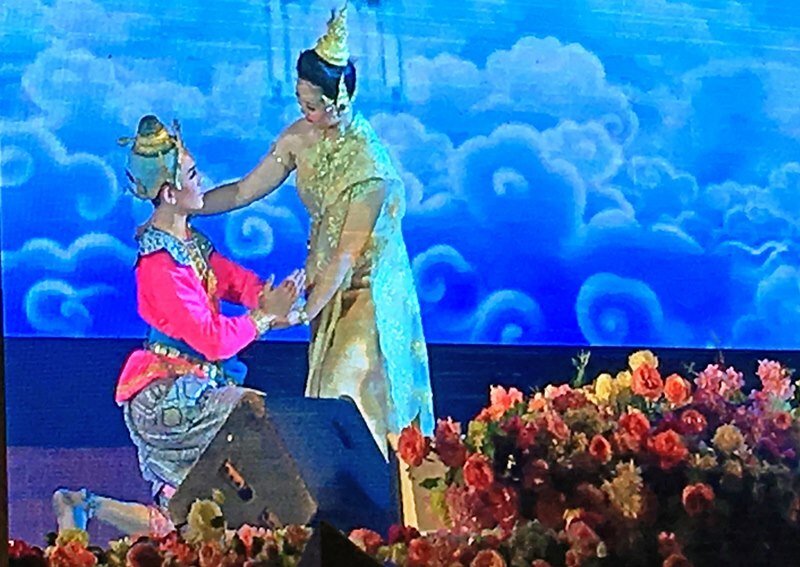 We watched dancers in gorgeous traditional costumes acting out the story, accompanied by Thai music and a solemn voice-over. A little difficult to follow but very lovely to look at. 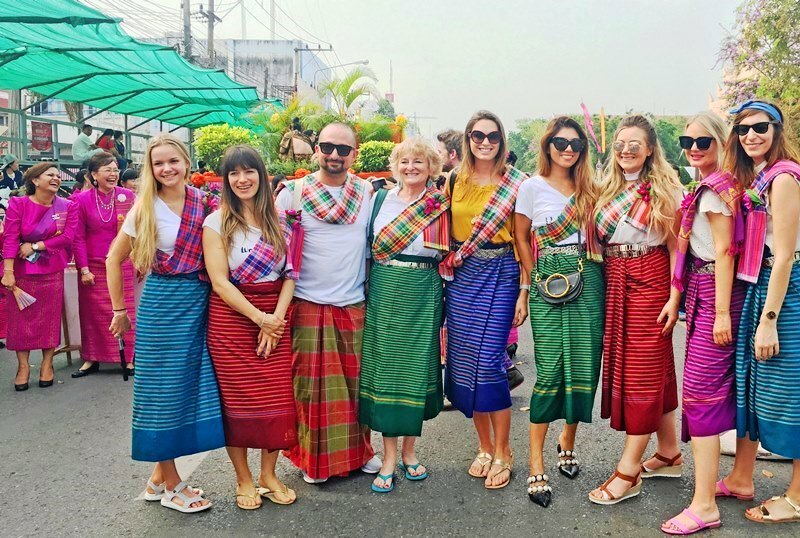 The friendliness, generosity of spirit and warm smiles from all the people we met, combined with some unusual sights and great food are what makes north east Thailand a very special place to visit. I visited north east Thailand courtesy of the Tourism Authority of Thailand. Many thanks to our hosts and guides for their courtesy, patience and extensive knowledge of this lesser-known area. All views and photos are my own. 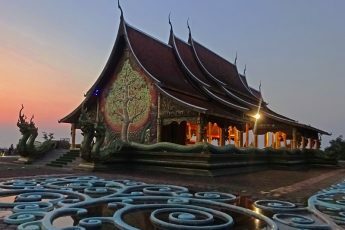 Do leave a comment with your thoughts or any tips for visiting Thailand. I’ve visited Thailand a number of times before, but never to the North East region. It’s still relatively undiscovered by tourists and feels like stepping back in time in many places. We travelled quite big distances seeing many wonderful sights and meeting lovely people.. Transport and accommodation Infrastructure is in the early stages in places. Watch out for my next article on top things to see and to in the area. If you are travelling to that region then do contact Thai Tourism who can help with more ideas on what to see and do and how to get around. What a unique experience – – both the policeman arranging your outfit and the parade. You are resplendent in your Thai silks! Yes Cindy, it was great fun and one of those surreal experiences I will never forget. Apparently there had not been such a big group of Europeans in this area before so we were made a big fuss of. Everyone was SO welcoming and it is a very special part of Thailand. Thai Isan are such friendly people. My family lives just a bit northeast of Roi Et. I really enjoyed reading about your experience and glad you had fun at the festival.